Remember that workshop my friend Jen Riday was leading and that I encouraged you to attend? Well it was AWESOME! That part about “purpose” is huge. I know so many moms feel like there’s something “more” they need to be doing with their time, but they aren’t quite sure what it is or how to find the time. Jen shared so many great time management tips (like task blocking!! I’m totally going to start doing that!). If you missed the workshop, Jen has graciously set up a video replay. Be sure to watch it soon because Jen said she’s only leaving it up for a couple of days). Spend WAY less time on mundane everyday tasks (that don’t move you forward!) and WAY MORE time on the things that are important to you. Have a place for EVERYTHING that needs doing… aka the art of creating “White Space” in your brain so you can feel lighter again. When you know exactly where to put each “to do” you can relax and know you’ll eventually get to it. Time Mastery for Women has been amazing for so many women! Be sure to click here and read about it yourself. TMFW is a game changer that I highly recommend if you want to feel in control of your life and time. How about you? Do you feel there’s something “more” you’d like to be doing with your time? Perhaps it’s a home-based business? Or preparing for that marathon? Or volunteering more? Or maybe you want to learn a new skill like cake decorating or how to play the piano? Whatever it is, you can’t just dive in willy-nilly and expect to stick with it long term if you don’t have a structured plan in place to help you create the TIME for it. And that’s why Time Mastery for Women is absolutely brilliant – Jen shows you step-by-step (teeny, tiny, doable steps that won’t overwhelm you!) how to get clear on what you actually want or “should” be doing with your time and life, how to use her digital templates to create consistent routines, a week-at-a-glance schedule, and a year-at-a-glance plan. These are simply HUGE for helping you master your use of time (and NOT feel like time is the master of you). I highly recommend you learn more about Time Mastery for Women. It’s a game changer! “Rely on Christ.” We hear that phrase often but what does it really mean to rely on Christ? In my life, when I think of someone I can rely on it means I can count on them day or night. It means that they would sit with me, fight for me, or hold me up. They would do all three if needed. I find in life that it is usually easier to rely on another person than Jesus because they are physically there in person. However, I have also learned that they will let you down. It might be harder to rely on and trust Jesus but it will bring more peace than you ever imagined. We must rely on Christ knowing that He has good plans for us and that He is our ROCK. My husband and I both want to leave a good legacy for future generations. That is why we fight so hard (sometimes with each other) and want to do so well in life. I’ve been thinking though that maybe God is supposed to be the one fighting and doing, not us? 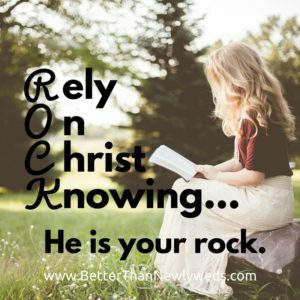 I say He is my ROCK. You have probably said it a time or two also. In the story of David and Goliath one of the key players is the rock he used. David gets the credit for killing the giant but it was really the rock. If he had used sand it would have been blown away. If he had used water it would have fallen to the sun scorched ground. David knew what (and who) he could rely on to take down his giant. Once he did his part he just needed to be still and watch the rock fight for him. I guess with marriage we are supposed to do and fight. I just don’t know how to get the balance between doing that and trusting God to also fight for our marriage. I think we so often feel we are alone that we forget God is way more passionate about our family and marriage success than we could ever imagine. We can rely on Christ knowing that He cares about our husbands and our marriages more than we do. We can rely on Christ knowing that He will never leave us or forsake us. I can rely on Christ knowing that He will sit with me, fight for me, and hold me up. Or all of them combined if needed. How would you finish the phrase? Unity in marriage is probably one of the best strategies to fireproof your marriage. In the midst of tough times, it becomes easy to get angry with our spouse, jump on the blame wagon or get caught up in the enemy’s attacks. Of course, the enemy does come to steal, kill and destroy. He is after our families and marriages. However, I would rather focus on keeping a united front with my husband in tough times than give the enemy attention. Why do I say this? Because one of the best ways to engage in spiritual warfare is to remain in unity with your spouse. Plus, I love being on the receiving end of God’s blessings. This Psalm is one of my favorites. I love the picture the psalmist used to describe unity. It’s part of our worship to the Lord. This week God really began speaking to me about unity. My hubby and I have been facing a tough financial year. A couple of weeks ago we found out that our finances were back to where they were in March this year. I felt all our efforts had been for naught. Still, I wasn’t as confronted with the importance of unity until Wednesday night. I was heading for prayer meeting at my church when I got fined by the cops for not renewing my car license (Grrrr). I don’t know who I was angrier at myself, my husband or God. Don’t partner with anger or blame; it will break your unity. Keep a united front with Sean. Immediately, my anger dissolved. Being angry or trying to blame wasn’t going to solve anything. I messaged my hubby and told him that I didn’t want to partner with anger or blame. We are a team and together we will come through our tough times. Ok. I admit. This week we still had a quarrel so this is a work in progress. That being said, I am aware of unity in our marriage. The more united we are with our spouse, the more our homes are filled with peace, joy, and kindness. At the end of the day, speaking to our spouse in anger doesn’t accomplish much. I can’t think of one example in my marriage where anger accomplished anything helpful. No. All anger has done is put a rift between me and my husband. Kindness, gentleness, and genuine encouragement serve to keep our hearts connected to each other. When we present a united front to the world we enter a “force field” of godly protection. Life and the enemy can shoot darts at us but they merely bounce off hitting the ground ineffective and useless. Hurray. Our marriages thrive in unity. Fun, flirting and joy echoes through your home causing your children to giggle or shake their ends in amusement at their love struck parents. Secretly, your children’s hearts are warmed at the love and security unity brings to them. Choose today to partner with God and choose unity.